Soon it will be time to buy tires. I have promised myself a set of 35's this time and the Jeep is already prepped for them. I have been running 33x12.50/15 Goodyear Duratracs on 15x10's (exactly 32" tall) and love them as my Jeep sees a LOT of highway miles. I know that combination doesn't work for a lot of people, but it has been excellent for me. My question revolves around road manners and balancing because we have struggled at times to balance the 33's through the years. I know the 17's should have better road manners and balance easier for the same reason that the ride quality of the 15's should also be better. Does anyone with experience with both have an opinion on which is better at 75-80 MPH down the highway and whether the 35's will be impossible to balance? If I go to 17's, I will also be going with a 9" wide wheel and because of width and backspacing will be tucking the outer edge of the wheel almost 1 1/2" further under the Jeep. Will these be Duratracs again? I don't think there should be an issue balancing those in any size. If you were having trouble with the 33s I'd find a different tire shop. I'd stick to 15s for ride comfort on all those highway miles. I love the Duratracs. They are not available in 35" in 15's, though. Right now, Duratracts and STT Pro's are leading the pack although the new tread compound on the Destination II MT's may be worth a shot. I loved my early set, they just had 0 traction....and I mean 0 (like snot on a doorknob) in snow and ice. Granted we see little of that here, but we travel in the winter and it is a factor. I'm running 35's on 15" rims without any problems at all. 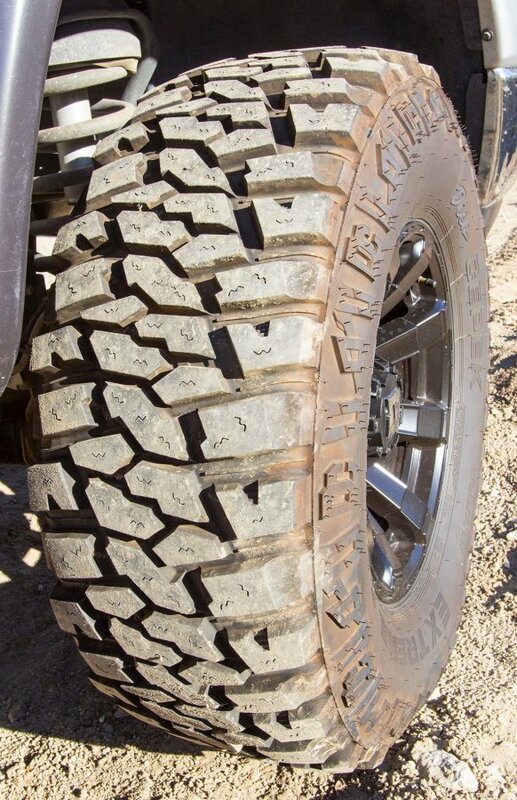 I'm running Yokohama Geolandar M/T's which I highly recommend if you don't have something in mind yet, lots of grip, aggressive sidewall lugs that help huge when you air down and zero problems balancing. Given the choice, I would probably move to a 17-18 inch rims now though just because I would like to move to 38's or 40's down the road and am not a huge fan of the mud truck look. Find More Posts by Zane S.
Edit: (I'm not sure how to really edit a post) From my experience any name brand tire you come across that you have actually heard of will probably not cause balancing issues. It is probably best to avoid Amazon cheapy tires or anything that seems too good to be true. Just my opinion. I've had 35s on 15 and 17" wheels, steel and aluminum. Like Biffgnar stated, go to a different tire shop. I now use a small shop that takes their time to balance them perfectly. All of my tire balance issues of the past are gone now. I got these balanced on steel wheels and no problems. They're my new favorite MT tire. I appreciate all the reply's. Part of the thinking behind moving to 17's was for tire selection as 35" 15's are getting harder to find, i.e. - Duratracs aren't made in that size. Another thing I need to stress....the balance "problems" I have had have been with several specialty shops who I KNOW have a handle on what they are doing. We went as far as pulling the tires off ourselves and checking runout on the wheels. I think I have a couple of tires with heavy spots and a wheel that is unbalanced. This will hopefully be cured with new tires. All of my experience beyond 33" tires, on the road anyway, has been with 16" or larger tires and they have performed and balanced perfectly. So, thanks again for the opinions and information. Keep it coming. Road Force balancing will fix almost any issue. OMG yes. Not available here. I can't find anyone to handle that for me. There seems to be a bunch of locations in your area. Thanks for that link. 2/3 of those are dealerships that are not fond of accepting work on an old Jeep. However, there are some surprising names on there that I have used/inquired with before and did not offer road force balancing. I'll get back with them. Interesting enough, I have friends at three or four of those shops. 4.1 gears enough for 35s. seems a bit low for a 4.0 especially one that sees highway. I think most in a Tj would say at least 5.13 and 5.38 since it seems they do make them now for the d30? gears tend to be the issue when people "move" up. Few do it first and of most things its one that wont be cheap. unless you can set them and have time to take two axle down. I think most in a Tj would say at least 5.13 and 5.38 since it seems they do make them now for the d30? I'm not aware of 5.38s for TJ D30. The 6-sp definitely lets me get away with less gear. I turn 2700-2900 RPM on the interstate with the 4.10's and I have a lot of motor. I will re-gear, most likely for the 35's. So, it was a situation where the money was there and we were going to build two axles @ either 4.56 or 4.88. I looked in craigslist and there was a G2 rear axle....complete, and a matching front that could be had for less than I would spend on the regear. It had under 10k miles on it and the differential I wanted. So, I ended up with 4.10's. They will most likely be changed shortly. With life happening at a blistering pace and the Jeep throwing me curve balls every time I turn around I just haven't gotten that far yet. I can say that with the 6 speed and my motor, 5.13 or 5.38, either one, would be too much gear. It will come down to the 4.56 or 4.88's. I have had a set of Super Duty axles already at 4.88 for 4-5 years that I would still love to throw under there. That would put me in the sweet spot cruising on the highway. I don't bury, sink, or attempt to roll this Jeep, so it probably sees what many consider a "conservative" life.